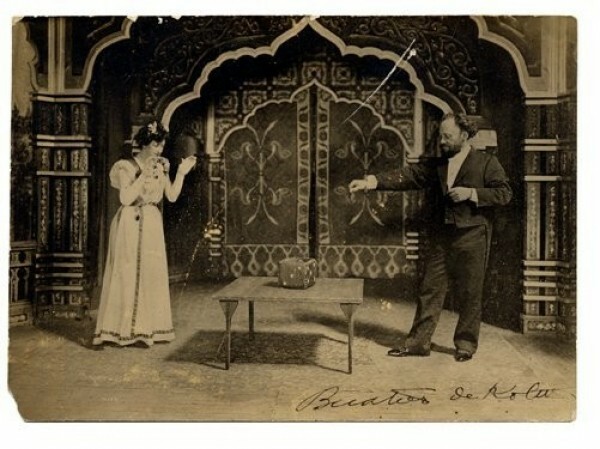 Magician Buatier de Kolta from Lyon, France was a magical genius but not a sophisticated charismatic performer like many of his contemporaries. Nonetheless, this boorish performer, who would bend over with his behind to the audience to spread a newspaper upon the stage, managed to have a hugely successful touring career and a legacy of creativity that endures to the present day. I have a special fascination for de Kolta because our lives have crossed paths many times, albeit with a century of separation. De Kolta’s career got started performing close-up magic in cafes in Lyon where, for 10 months, I also did close-up magic. He grew up in the Lyon neighborhood of La Croix Rousse where I spent some very memorable times in my youth. He is famous for inventing the vanishing lady which Doug Henning subsequently taught to the music group Earth, Wind & Fire whom I saw perform it at the Chicago Stadium in 1979. In 1992 I performed that very same illusion in my first Chicago theater show. I’m a Chicago magician and Buatier made his near final performance in Chicago in 1903. While performing in a Lyon cafe, budding magician Charles Buatier met a Hungarian theatrical impresario named Julius Vido de Kolta. De Kolta offered to become young Charles’ manager, a deal was struck, the two took off on tour in Italy and Charles took the stage name of “Buatier de Kolta”. The impresario turned out to be a con artist, but Buatier’s creativity and career was launched. Shortly following that very performance, Buatier was struck with acute Bright’s Disease. He died just 6 weeks later at his wife Alice’s side but not before fathering his first and only child with his assistant Lizzie Allen who gave birth the following March. Warlock, Peter, et al. Buatier de Kolta: genius of illusion. Magical Publications, 1993.